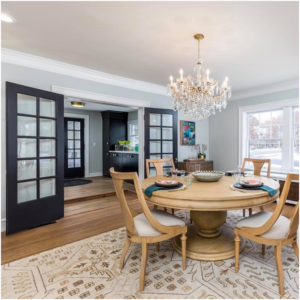 We carry Kaleen Rugs at both Columbia Paint located in Columbia, MD and Clarksville Paint and Decorating, located in Clarksville, MD. There are rugs in every style to perfectly complement your décor. The size can be customized to fit your room in many of the styles. Last month, we discussed the importance of scale as an important principle in design. 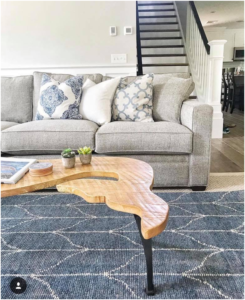 The option to customize your rug size allows you to find the perfect fit for the scale of your room. Looking for a bold accent to add to your home? 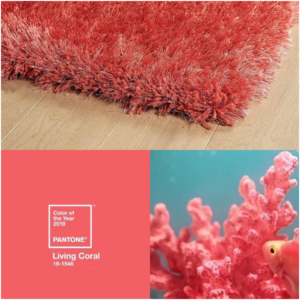 This plush and colorful rug adds texture and interest to any room. The textural softness helps to dampen loud sounds as well as having a soft, tactile appeal. A rug can be used to bring interest, color, and pattern to an otherwise boring or overlooked area of your home. For added texture and interest, try layering rugs. 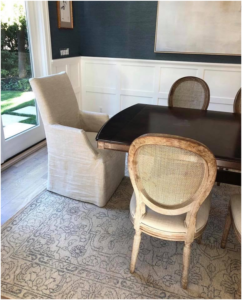 This navy rug layered on top of a sisal brings depth and dimension to the flooring in the room. At Columbia Paint, we are here to help you find that perfect rug to unify the décor in your room. Our selection of colors, patterns and sizes provides options for every style and budget. All Kaleen rugs are currently 40% off, so come see us soon!